Some products even in the most minimal quantities have a unique effect on the body. They speed up the metabolism, slow down aging and increase efficiency. In addition, they make the daily diet more interesting and diverse. In terms of their chemical composition, these superfoods do not look like other foods: a high concentration of protein, vitamins, minerals, essential acids, antioxidants and other nutrients with a minimum of calories is amazing. The benefits of these products are confirmed by scientific research and many years of experience. Powdered leaves of green tea with a very rich, gentle and slightly sweet flavor give a charge of vivacity, increase physical endurance and improve mood. 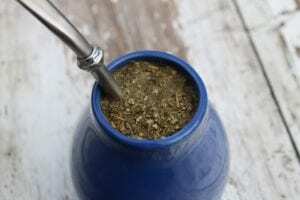 In addition, mate tea is a source of antioxidants, vitamins and fiber. Connoisseurs of this drink are sure: one of his cups brings as much benefit to the body as 10 cups of ordinary green tea. This tonic is perfect for starting the day. Unrefined sesame from the usual white differs strongly pronounced flavor and taste. In addition, black seeds contain 60% more calcium. 30-40 g per day provide 37% of the daily requirement of the organism in this trace element. Sesame improves blood composition, metabolism and digestive tract work, and also has a beneficial effect on the nervous system. And sesame reduces blood cholesterol levels and regulates sugar levels, preventing the development of diseases such as atherosclerosis, osteoporosis and diabetes. Important nuance: sesame seeds need to soak for at least 8 hours, so that it is better absorbed. And from it you get delicious sesame milk. Flax seeds – This is an excellent source of protein, fiber, polyunsaturated omega-3 acid, minerals (manganese, zinc, magnesium, selenium and iron) and phytoestrogens (lignans). Flax normalizes the work of the hormonal system, which is important for women. In addition, flax seeds work as a sorbent, cleansing the body of cholesterol and harmful toxins. And a mixture of 1 tablespoon of flaxseed and 3 tablespoons of water replaces eggs in baking, which is important for those who do not eat animal products. Important note: to neutralize phytic acid, flax should be soaked for 8 hours. The formed mucus is useful, and it is not necessary to wash flax after soaking. Grinded into a fine powder, almonds retain all their useful properties and do not lose them even when heat treated. Almond flour contains saturated fatty acids, practically the whole range of B vitamins, choline, beta-carotene, calcium, magnesium, phosphorus, iron and other trace elements. Thus almond flour practically does not contain gluten. It can replace the usual flour in the preparation of baking, marzipan, pancakes, fritters and other confectionery. But there is an important remark: almonds are very caloric, so people with excess weight should use it with caution. The latest trend in dietology is a reduction in the diet of carbohydrates due to the increase in fats and proteins. Fats are necessary for the body, but it is important to choose the right sources. For example, coconut oil and Ghee oil. They are best fried, because they can withstand high temperatures when heated, without forming toxic and carcinogenic substances. Coconut oil is one of the main sources of fatty saturated acids. 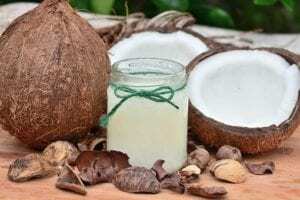 In addition, the product contains calcium, phosphorus, vitamins A, C and E. Coconut oil has a positive effect on the brain, increases the level of “good” cholesterol and lowers the “bad” level. And also has an antioxidant effect, reducing the likelihood of vascular and heart disease. Ghi oil is highly valued in Ayurveda. It does not contain lactose, it is easy to digest and nourish the body. Ghi does not increase the level of “bad” cholesterol, cleanses the liver and intestines, strengthens the immune system, normalizes metabolism, removing all excess from the body. And the dishes cooked with this oil have an excellent taste. The popular Japanese seasoning based on sesame, seaweed and sea salt improves the functioning of the cardiovascular system. You can use gomasio instead of regular salt as a condiment to soups, salads and other dishes. A fermented drink based on tea leaves, sugar and directly the kombucha itself has a powerful antioxidant and anti-inflammatory effect. Kombucha strengthens immunity by supporting healthy intestinal microflora, whose composition determines the immune response of the body by 80%. Miracle drink perfectly quenches thirst, and in summer it can be drunk instead of lemonade. Also kombucha helps maintain weight in the norm, improving metabolism and reducing fat deposits. Attention: with caution kombucha should be used for diabetes and increased acidity of the stomach. An allergic reaction is possible in cases of individual intolerance to one of the components of the drink. 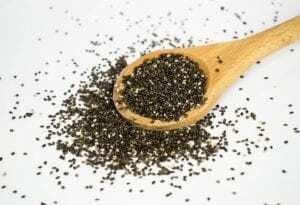 In these small seeds 8 times more omega-3 than in salmon, 6 times more calcium than in milk; 3 times more iron than in spinach; 2 times more potassium than in bananas; 15 times more magnesium than in broccoli. Such a rich composition makes chia seeds a real vitamin-mineral complex. 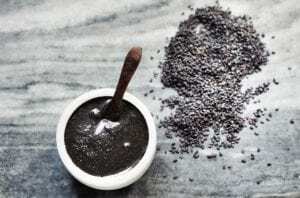 In addition, chia contains a lot of fiber and slows down the absorption of food, helping to maintain a sense of satiety for a long time and preventing the appearance of extra pounds.